A fun idea coming from our friends at Inside Out magazine's online site, homelife. 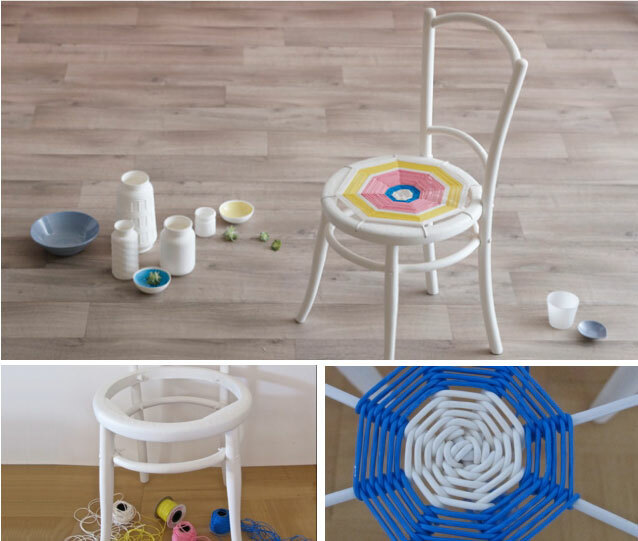 A step-by-step project by Tamara Maynes on how to weave a new seat for a chair! Using something called ‘Sgetti’ plastic string. Perfect for a weekend project. Get the how-to and materials list here. (Also if you're in the mood for something love-themed, check out their beautiful Valentine's Day gift wrapping ideas here). Photo homelife | Styling Vanessa Colyer Tay. Wow, what a great idea! :-) Love it! Thanks from Beate in Norway. ah...we have a few bottomless seats! now I know what to do with them!